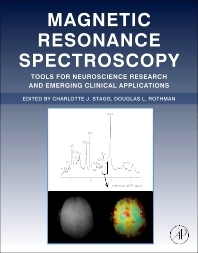 Magnetic Resonance Spectroscopy: Tools for Neuroscience Research and Emerging Clinical Applications is the first comprehensive book for non-physicists that addresses the emerging and exciting technique of magnetic resonance spectroscopy. Divided into three sections, this book provides coverage of the key areas of concern for researchers. The first, on how MRS is acquired, provides a comprehensive overview of the techniques, analysis, and pitfalls encountered in MRS; the second, on what can be seen by MRS, provides essential background physiology and biochemistry on the major metabolites studied; the final sections, on why MRS is used, constitutes a detailed guide to the major clinical and scientific uses of MRS, the current state of teh art, and recent innovations. Magnetic Resonance Spectroscopy will become the essential guide for people new to the technique and give those more familiar with MRS a new perspective. Section 2: Biochemistry—What Underlies the Signal? Section 2: Biochemistry — What Underlies the Signal?